Music is a great way to encourage development and enhance creativity, even in the littlest ones. Especially with the little ones! Children are naturally drawn to music which makes it easy to engage them. Music also is a great way to encourage communication in these pre-verbal kiddos. When our son was just learning to sit up, we started using ASL (American Sign Language) and Baby Signs. We wanted to offer him a way to communicate with us without needing words and without having to scream and cry and throw a fit. After many months of watching us sign he started to use the signs as well! 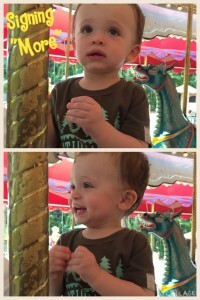 He was about 10 months old when he first signed “more” and first waved “hello”. 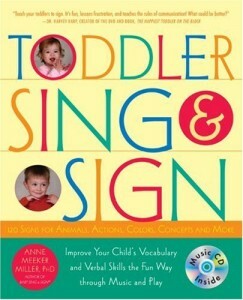 Children usually beginning signing somewhere between 10 and 14 months old. He was effectively signing “more” and “sleep” and “drink” by 12 months. Now at 16 months he signs “more”, “sleep”, “pacifier”, “drink”, football”, “music”, “please”, “thank you”, “bath”, “toilet” (which we use for diaper), “book”, “all done”, “down”, and “up”. Its very interesting to see how he interprets the signs and makes them his own. His version of the sign isn’t exactly accurate but he has learned it just the same and it still makes for meaningful communication! If you look at the picture at the top of this article you will see my son signing “drink”. Now if you look at the sign for “drink” or “cup” you’ll see that his version is only an approximation. But its his sign for “drink”! Here is a clip of him signing “music”. 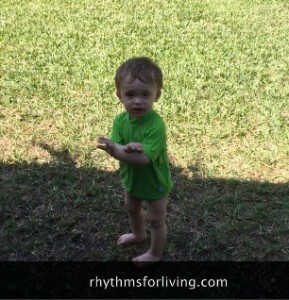 When he discovered the wind chimes he started signing “music” in reference to them. You can see that his version is slightly different than the true sign, but he and I both know what it is. A great way to teach, model, and practice signing is through music. Whether you are incorporating the signs in the song or just playing music and then asking if they want “more”, music is a great tool for learning and reinforcing. 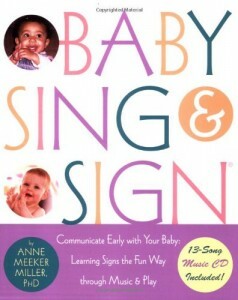 A favorite resource of mine is Anne Meeker Miller’s Baby Sing & Sign. 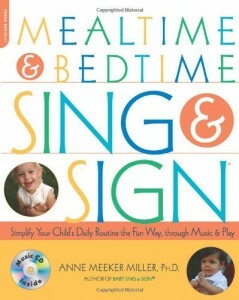 She has three books/cds for signing: Baby Sign & Sign, Toddler Sing & Sign, and Mealtime & Bedtime Sing & Sing. Each book has songs that are fun and creative, and beautifully orchestrated and recorded. Each song practices targeted signs that are useful in a child’s every day life. I also found a great app for iPhone that allows me to look up a sign and quickly learn it. 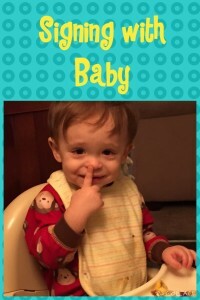 Its called Baby Sign Language Dictionary. There is a lite version which is free or you can get the full dictionary for $2.99. If you haven’t considered signing with your baby or toddler I encourage you to give it a try. Pick just a few to start and as you and your little one master those, add more. You’ll find it helps reduce frustration by offering your child a way to communicate and helps you to more easily know what they need and want. 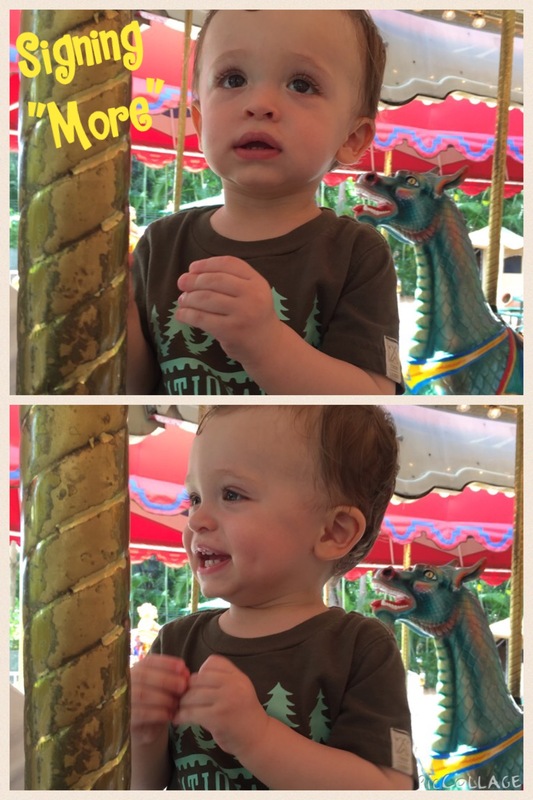 How are you using signs with your child? Do you use music to practice or learn new signs? Let us know! For more information on how we use music with early childhood click here!